The 6000 Mid-Harrow will be the most versatile harrowing unit you'll ever operate. The 6000 Mid-Harrow is available in 70' or 90' (21.3m to 27.4m) working widths. Hydraulic Boom Height and Angle Control provides convenient on-the-go adjustment. The 6000 Mid-Harrow bridges the gap between regular and heavy harrows. Requires only 3 HP per foot for operation. The 6000 Mid-Harrow features 5 rows of 7/16 ” x 20” (11 x508mm) straight tines on 2” (51mm) centres. 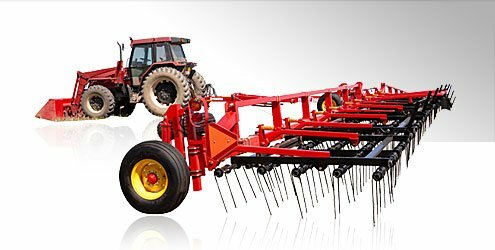 You can get more acres out of your harrow tines with the Bourgault 6000 Mid-Harrow. A Double Acting Cable design gives the operator the benefits of a cable and a solid draw without any negative effects.